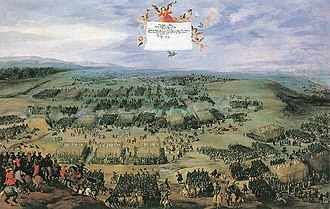 Archduke Leopold in The Siege of Gravelines (1652), by Peter Snayers. Archduke Leopold Wilhelm of Austria (5 January 1614 – 20 November 1662) was an Austrian military commander, Governor of the Spanish Netherlands from 1647 to 1656, and a patron of the arts. Born at Wiener Neustadt, he was the youngest son of Holy Roman Emperor Ferdinand II and Maria Anna of Bavaria (1574–1616), daughter of William V, Duke of Bavaria. His elder brother became Emperor Ferdinand III (1608–1657). Leopold Wilhelm served as a general in the Thirty Years' War, commanding in the Second battle of Breitenfeld (1642), and in the Franco-Spanish War (1635–1659). 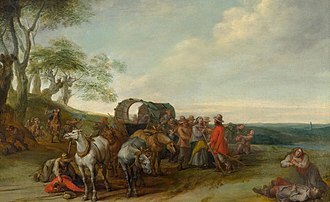 During the latter war, the Spanish-Low Country forces under Leopold Wilhelm lost the Battle of Lens in an attempt to recover the city in 1648. Later in the war, he sallied forth from the Netherlands on two occasions. 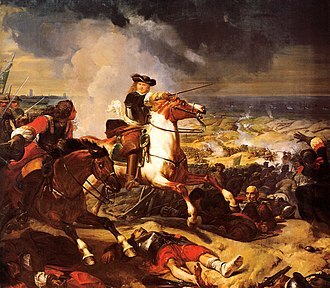 On the second, he successfully seized a number of northern French forts in February–March 1652, forcing the French to withdraw forces from Catalonia to reinforce their northern frontier. This assisted Spanish forces in Spain in recovering Catalonia from the French-backed Catalan rebellion. Even though Leopold Wilhelm lacked the canonical qualifications, he was invested, with the help of his father, with a number of prince-bishoprics in order to provide him with an income. Unqualified as he was, he officially only held the title administrator, nevertheless realising the full episcopal revenues, of the prince-bishoprics of Halberstadt (1628–1648), Passau (1625–1662), Breslau (1656–1662), Olmütz (1637–1662) and Strasbourg (1626–1662). In 1635, Pope Urban VIII authorised him to become the prince-archbishop of Bremen, but due to its occupation by the Swedes he never gained de facto power. He returned to Vienna after the situation in the Spanish Netherlands had deteriorated in 1656. 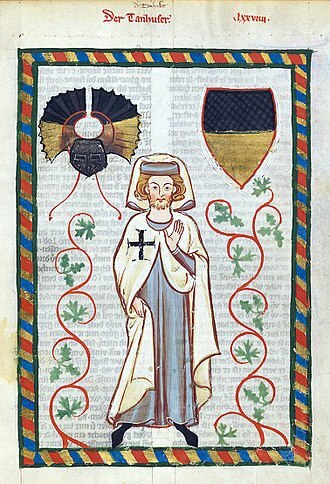 In Vienna he was initially occupied with the administration of his various bishoprics, the Teutonic Order which he led as Grand Master and the family affairs of the imperial house. After the death of his elder brother Emperor Ferdinand III, several electors put him forward for the position of Emperor. However, he stalled to allow his nephew to reach the statutory age to ascend the imperial throne, which his nephew did as Leopold I on 22 July 1658 at the age of 18 years. After devoting himself to the affairs of state, Leopold Wilhelm retired in his final years and lived exclusively for the love of art. He died in Vienna in 1662. When he assumed the government of the Spanish Netherlands, Leopold Wilhelm, being a great lover of art, employed several painters from the Antwerp Guild of Saint Luke, including the great Flemish painter David Teniers the Younger, who he not only employed as a painter but as keeper of the collection of pictures he was then forming. With the rank and title of "ayuda de camara," Teniers took up his abode in Brussels shortly after 1647. Immense sums were spent in the acquisition of paintings for the archduke, including paintings by Frans Snyders, Peter Snayers, Daniel Seghers, Peter Franchoys, Frans Wouters, Jan van den Hoecke, Pieter Thijs, Jan van de Venne and others. 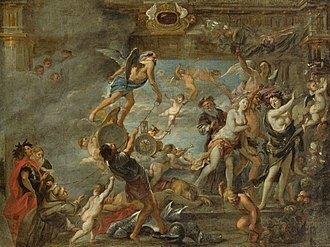 A number of valuable works of the Italian masters, now in the Vienna Museum, came from Leopold's gallery after having belonged to Bartolomeo della Nave, Charles I and the duke of Buckingham. 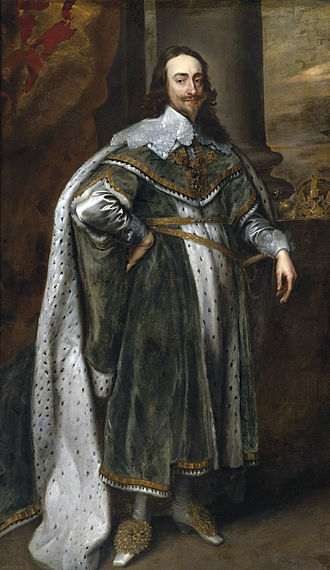 He commissioned the British painter John Michael Wright in 1650 to travel to Cromwell's England, and acquire art and artifacts at the great Commonwealth sale of the late king's goods. This expansion of his collection was celebrated by having his most prized pieces engraved in the book Theatrum Pictorium, often called the first "art catalog". 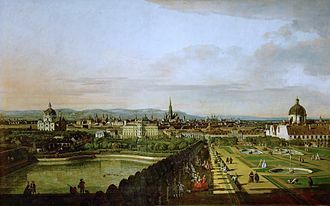 When Leopold returned to Vienna, his collection of paintings was relocated to the Stallburg gallery in Hofburg Palace. Jan Anton van der Baren, a Flemish priest, who was also a first-rate flower painter, became director of the archducal gallery. Leopold bequeathed his gallery to his nephew Leopold I, and it became imperial property. It is now part of the collections of the Kunsthistorisches Museum in Vienna. When the tomb of Childeric I, an early Merovingian king of the Salian Franks and father of Clovis I was discovered in 1653 by a mason doing repairs in the church of Saint-Brice in Tournai, it was Leopold Wilhelm who had the find published in Latin. Schreiber, Renate (2004). "Ein Galeria nach meinem Humor": Erzherzog Leopold Wilhelm. Vienna: Kunsthistorisches Museum. ISBN 3854970854. ^ Wurzbach, Constantin, von, ed. (1860). "Habsburg, Leopold Wilhelm" . Biographisches Lexikon des Kaiserthums Oesterreich [Biographical Encyclopedia of the Austrian Empire] (in German). 6. pp. 444–446 – via Wikisource. ^ a b Wurzbach, Constantin, von, ed. (1861). "Habsburg, Maria Anna von Bayern" . Biographisches Lexikon des Kaiserthums Oesterreich [Biographical Encyclopedia of the Austrian Empire] (in German). 7. p. 23 – via Wikisource. ^ a b c d e f Cartwright, Julia Mary (1913). Christina of Denmark, Duchess of Milan and Lorraine, 1522-1590. New York: E. P. Dutton. pp. 536–539. ^ a b Wurzbach, Constantin, von, ed. (1860). "Habsburg, Anna von Oesterreich (1528–1587)" . Biographisches Lexikon des Kaiserthums Oesterreich [Biographical Encyclopedia of the Austrian Empire] (in German). 6. p. 151 – via Wikisource. The Guild of Saint Luke was the most common name for a city guild for painters and other artists in early modern Europe, especially in the Low Countries. They were named in honor of the Evangelist Luke, the saint of artists. One of the most famous such organizations was founded in Antwerp and it continued to function until 1795, although by it had lost its monopoly and therefore most of its power. In most cities, including Antwerp, the government had given the Guild the power to regulate defined types of trade within the city. Guild membership, as a master, was required for an artist to take on apprentices or to sell paintings to the public. Similar rules existed in Delft, where members could sell paintings in the city or have a shop. The guild of Saint Luke not only represented painters and other artists, but also—especially in the seventeenth century—dealers, amateurs. 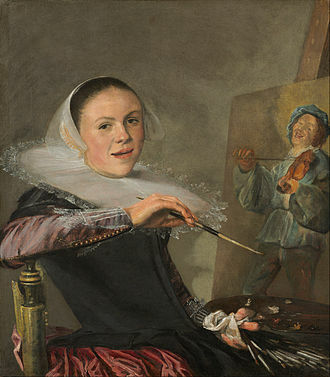 In traditional guild structures, house-painters and decorators were often in the same guild, however, as artists formed under their own specific guild of St.
Luke, particularly in the Netherlands, distinctions were increasingly made. 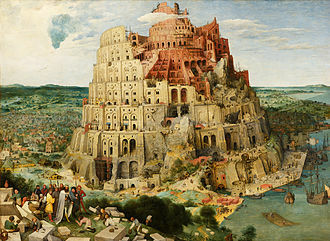 In general, guilds made judgments on disputes between artists and other artists or their clients, in such ways, it controlled the economic career of an artist working in a specific city, while in different cities they were wholly independent and often competitive against each other. Although it did not become an artistic center until the sixteenth century, Antwerp was one of, if not the first. 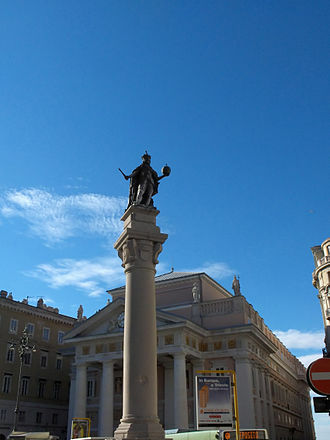 It is first mentioned in 1382, and was given privileges by the city in 1442. The registers, or Liggeren, from the guild exist, cataloging when artists became masters, who the dean for each year was, what their specialities were, and the names of any students. Perhaps because of this link, for a period they had a rule that all miniatures needed a tiny mark to identify the artist, only under special privileges, such as court artist, could an artist effectively practice their craft without holding membership in the guild. Membership allowed members to sell works at the guild-owned showroom, for example, opened a market stall for selling paintings in front of the cathedral in 1460, and Bruges followed in 1482. The Kunsthistorisches Museum is an art museum in Vienna, Austria. Housed in its festive palatial building on Ringstraße, it is crowned with an octagonal dome, the term Kunsthistorisches Museum applies to both the institution and the main building. It is the largest art museum in the country and it was opened around 1891 at the same time as the Naturhistorisches Museum, by Emperor Franz Joseph I of Austria-Hungary. The two museums have similar exteriors and face each other across Maria-Theresien-Platz, both buildings were built between 1871 and 1891 according to plans drawn up by Gottfried Semper and Karl Freiherr von Hasenauer. The two Ringstraße museums were commissioned by the Emperor in order to find a shelter for the Habsburgs formidable art collection. The façade was built of sandstone, the building is rectangular in shape, and topped with a dome that is 60 meters high. The inside of the building is decorated with marble, stucco ornamentations, gold-leaf. It was featured in an episode of Museum Secrets on the History Channel and it had been the biggest art theft in Austrian history. Anselm van Hulle or Anselmus van Hulle was a Flemish painter mainly of portraits whose works were highly prized at the Northern European Courts. Anselm van Hulle was baptized in the St. Bavo Church in Gent on 23 July 1601 and he was the son of Egidius van Hulle. He may have been a pupil of Gaspar de Crayer, a leading Baroque painter from Antwerp working mainly in Brussels, a training with such a prominent painter was relatively expensive. Van Hulle became a master in the Guild of St. Luke of Gent in 1620 and he probably made a trip to Italy in 1631 but was back in Gent in the same year. He married on 14 December 1631 with Livina of Thuyne, the couple had four children, who were all baptized in the St. Bavo Church. It is not clear when he moved to the Dutch Republic and he became court painter to the Dutch stadtholder Frederick Henry, Prince of Orange. Van Hulle made various portraits of persons of the Orange dynasty, the Prince sent him in 1645 or 1646 to Münster to make portraits of the delegates who attended the peace negotiations for the Peace of Münster. Van Hulle established a workshop in Münster to make the portraits. The Flemish painter Jean-Baptist Floris was likely initially an employee of van Hulle’s workshop, Floris is recorded as having received a commission for 34 portrait paintings of the delegates for the Münster Town Council at a price of ten thalers. Van Hulle typically charged 10 ducats for a bust painted by himself, van Hulle was active as an art dealer during his residence in Münster. He left Münster for a while in 1647 to attend to a matter in the family of his wife. After the conclusion of the negotiations in Münster, van Hulle followed the delegates to Nuremberg where the debriefings took place in 1649. His patron Frederick Henry died the same year and he travelled to Kassel in 1650 and was active at the Dresden court in 1651. He probably worked at courts in the region. From 1652 he was active in Vienna where he entered the service of Emperor Ferdinand III, the emperor gave him a peerage on 27 August 1652. The Emperor sent him to Gottorf Castle in 1653 to paint a portrait of Frederick III, the last known record about van Hulle relates to his administration of the estate of Livina van den Tuyne for which he appeared before a notary in Gent, together with his son Pieter. Many of his works depict low-life genre scenes of tooth-pullers, card-players and hurdy-gurdy players and expressive religious scenes. Works by Jan van de Venne were formerly attributed to an artist referred to as ‘Pseudo-Van de Venne’ and this Pseudo-Van de Venne was erroneously believed to be the brother, called Jan, of the better known Dutch painter Adriaen van de Venne. Adriaens brother Jan, died in Middelburg in 1625, art historian Jacques Foucart from the Louvre corrected the wrong attribution in an article published in 1978. Foucart identified Pseudo-Van de Venne with another Jan van de Venne whom he identified as a Flemish artist and this identification of ‘Pseudo-Van de Venne’ with Jan van de Venne, an artist believed to have been born in Mechelen c. 1600, has gained wide acceptance. Very little is known about Jan van de Vennes life and career, even though some of the artist’s works bear the mark of the Antwerp Guild of Saint Luke, he is believed to have been active mainly in Brussels. This is testified by his relationships with prominent personalities in Brussels including at the court, Both Cardinal-infant Ferdinand and Archduke Leopold Wilhelm, the governors of the Southern Netherlands, were his patrons. Van de Venne is recorded as a master in the Guild of Saint Luke in Brussels in 1616 and he is believed to have been active as a painter as well as a gilder of moldings and perhaps even a painter of imitation marble on frames and altarpieces. He remained active in Brussels where he died in or before 1651, van de Venne left very few signed paintings. His oeuvre has been reconstituted based on signed or documented works which show his very individual style, use of light and his works are typically small-scale oil on panel compositions. Van de Venne specialised in caricatures of so-called ‘low-life’ subjects, such as card-players, tooth-pullers and musicians and his paintings demonstrate harsh caricatures in a stronger light than Adriaen Brouwer. Various historians have attempted to explain the origins of his style and they have identified a range of influences on the work of van de Venne, his themes and style are reminiscent of his contemporary Adriaen Brouwer. Antwerp is a city in Belgium, the capital of Antwerp province in the region of Flanders. With a population of 510,610, it is the most populous city proper in Belgium and its metropolitan area houses around 1,200,000 people, which is second behind Brussels. Antwerp is on the River Scheldt, linked to the North Sea by the Westerschelde estuary, the Port of Antwerp is one of the biggest in the world, ranking second in Europe and within the top 20 globally. Antwerp has long been an important city in the Low Countries, the inhabitants of Antwerp are nicknamed Sinjoren, after the Spanish honorific señor or French seigneur, referring to the Spanish noblemen who ruled the city in the 17th century. The city hosted the 1920 Summer Olympics, according to folklore, notably celebrated by a statue in front of the town hall, the city got its name from a legend about a giant called Antigoon who lived near the Scheldt river. He exacted a toll from passing boatmen, and for those who refused, he severed one of their hands, eventually the giant was killed by a young hero named Silvius Brabo, who cut off the giants own hand and flung it into the river. Hence the name Antwerpen, from Dutch hand werpen, akin to Old English hand and wearpan, a longstanding theory is that the name originated in the Gallo-Roman period and comes from the Latin antverpia. Antverpia would come from Ante Verpia, indicating land that forms by deposition in the curve of a river. Note that the river Scheldt, before a period between 600 and 750, followed a different track. This must have coincided roughly with the current ringway south of the city, many historians think it unlikely that there was a large settlement which would be named Antverpia, but more something like an outpost with a river crossing. However, John Lothrop Motley argues, and so do a lot of Dutch etymologists and historians, aan t werp is possible. This warp is a hill or a river deposit, high enough to remain dry at high tide. Another word for werp is pol hence polders, historical Antwerp allegedly had its origins in a Gallo-Roman vicus. Excavations carried out in the oldest section near the Scheldt, 1952–1961, produced pottery shards, the earliest mention of Antwerp dates from the 4th century. George Villiers, 1st Duke of Buckingham, KG, was an English courtier and patron of the arts. He was a favourite—and a lover—of King James I, George Villiers was born in Brooksby, Leicestershire, on 28 August 1592, the son of the minor gentleman Sir George Villiers. His mother Mary, daughter of Anthony Beaumont of Glenfield, was left an early and educated him for a courtiers life. Villiers took very well to the set by his mother, he could dance and fence well, spoke a little French. Bishop Godfrey Goodman declared Villiers to be the man in all of England, his limbs so well compacted, and his conversation so pleasing. In August 1614 at age twenty-one, Villiers caught the eye of James I at a hunt in Apethorpe, opponents of the kings favourite Robert Carr saw an opportunity to usurp the Earl of Somerset and began promoting Villiers. Money was raised to purchase Villiers a new wardrobe, and intense lobbying secured his appointment as Royal Cupbearer, a position that allowed him to make conversation with the king. Villiers began to appear as a dancer in masques from 1615, in which he could exhibit his grace of movement and beauty of body, under the kings patronage Villiers advanced rapidly through the ranks of the nobility, and his court appointments grew in importance. In 1615 he was knighted as a Gentleman of the Bedchamber, in 1616, when he was made Master of the Kings Horses, he was elevated to the peerage as Baron Whaddon, Viscount Villiers, and made a Knight of the Garter. The next year he was made Earl and in 1618 promoted Marquess of Buckingham, Villiers new rank allowed him to dance side by side with the royal heir Charles I, with whom his friendship developed through his tutoring of the prince in dance. Villiers was appointed Lord Admiral of the Fleet in 1619, since reductions in the peerage had taken place during the Tudor period, Buckingham was now the highest-ranking subject outside the royal family. The personal relationships of James are much debated, with Villiers the last in a succession of handsome young favourites the king lavished with affection, contemporaneous evidence is interpreted by some to suggest that Villiers was James lover. David Teniers the Younger was a Flemish artist born in Antwerp, the son of David Teniers the Elder. His son David Teniers III and his grandson David Teniers IV were painters and his wife Anna, née Anna Breughel, was the daughter of Jan Brueghel the Elder and the granddaughter of Pieter Bruegel the Elder. Through his father, he was influenced by Elsheimer and by Rubens. The influence of Adriaen Brouwer can be traced to the outset of his career, the only trace of personal relations having existed between Teniers and Rubens is the fact that the ward of the latter, Anne Breughel, the daughter of Jan Breughel, married Teniers in 1637. Admitted as a master in the Guild of St Luke in 1632, the Berlin Museum possesses a group of ladies and gentlemen dated 1630. No special signature positively distinguishes these first productions from those of his father, Dr. Bode, in a study of Brouwer and his works, expresses the opinion that Tenierss earliest pictures are those found under the signature Tenier. Tenier is a Flemish version of a thoroughly Walloon name, Taisnier which the grandfather, a mercer, brought with him when he came from Ath in 1558. His touch is of the rarest delicacy, his colour at once gay and he was little over thirty when the Antwerp guild of St. George enabled him to paint the picture which ultimately found its way to the Hermitage in St. Petersburg the Meeting of the Civic Guards. Correct to the minutest detail, yet striking in effect, the scene, under the rays of sunshine, displays an astonishing amount of acquired knowledge. Teniers was chosen by the council of Antwerp to preside over the Guild of Saint Luke in 1644. 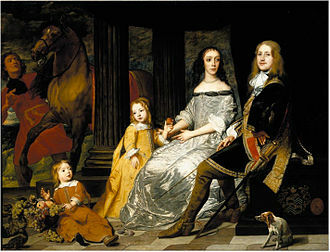 The Archduke Leopold Wilhelm, who had assumed the government of the Spanish Netherlands employed Teniers as a painter, with the title of ayuda de camara, Teniers moved to Brussels shortly after 1647. Immense sums were spent buying paintings for the archduke, a number of valuable works of Italian masters, now in the Kunsthistorisches Museum, came from Leopold Wilhelms gallery after having belonged to Charles I and the Duke of Buckingham. 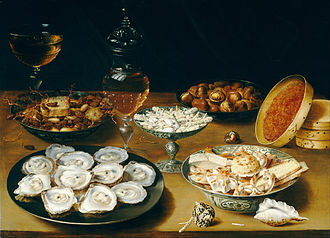 De Bie states that Teniers visited London, collecting pictures for the Duke of Fuensaldana, acting as Leopold Wilhelms lieutenant in the Netherlands. Pope Urban VIII, reigned as Pope from 6 August 1623 to his death in 1644. He expanded the territory by force of arms and advantageous politicking, and was a prominent patron of the arts. However, the debts incurred during his pontificate greatly weakened his successors. He was involved in a controversy with Galileo and his theory on heliocentrism during his reign and he is the most recent pope to date to take the pontifical name of Urban upon being elected as pope. He was born Maffeo Barberini in April 1568 to Antonio Barberini, a Florentine nobleman and his father died when he was only three years old and his mother took him to Rome, where he was put in the charge of his uncle, Francesco Barberini, an apostolic protonotary. At the age of 16 he became his uncles heir and he was educated by the Society of Jesus, and received a doctorate of law from the University of Pisa in 1589. In 1601, through the influence of his uncle, was able to secure from Pope Clement VIII appointment as a legate to the court of King Henry IV of France. In 1604, the pope appointed him as the Archbishop of Nazareth. At the death of his uncle, he inherited his riches, on 6 August 1623, at the papal conclave following the death of Pope Gregory XV, Barberini was chosen as Gregory XVs successor and took the name Urban VIII. Upon Pope Urban VIIIs election, the Venetian envoy, wrote the description of him. His Holiness is tall, with features and black hair turning grey. He is exceptionally elegant and refined in all details of his dress, has a graceful and aristocratic bearing and he is an excellent speaker and debater, writes verses and patronises poets and men of letters. Urban VIIIs papacy covered 21 years of the Thirty Years War, despite an early friendship and encouragement for his teachings, Urban VIII was responsible for summoning the scientist and astronomer Galileo to Rome in 1633 to recant his work. Urban VIII practiced nepotism on a scale, various members of his family were enormously enriched by him. He elevated his brother Antonio Marcello Barberini and his nephews Francesco Barberini and he bestowed upon their brother, Taddeo Barberini, the titles Prince of Palestrina, Gonfalonier of the Church, Prefect of Rome and Commander of SantAngelo. Peter, Peeter or Pieter Franchoys or Francois was a Flemish Baroque painter, who is mainly known for his portraits and religious paintings. He studied painting with his father, Lucas Franchoys the Elder and he is subsequently recorded in Brussels, where he worked for the governor of the Southern Netherlands Archduke Leopold Wilhelm of Austria. In 1631 he traveled to France and is recorded in Paris and he returned to Mechelen in 1635. In 1646 he became a member of the Mechelen schutterij and in 1649 he became a master in the Guild of St. Luke there and his younger brother Lucas was a successful painter. Peter Franchoys is now known as a painter of portraits. His portraits are stylistically related to his brother’s portraits who represented his sitters with a form of calculated informality and this style was influenced by Anthony van Dyck as well as by French models of portrait painting. The French influence is seen in the more static approach as opposed to the quality of Flemish Baroque portrait paintings. 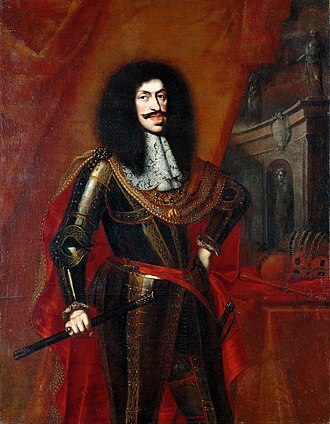 Leopold I was Holy Roman Emperor, King of Hungary and Croatia, King of Bohemia and King of Serbia. The second son of Ferdinand III, Holy Roman Emperor, by his first wife, Maria Anna of Spain, elected Holy Roman Emperor in 1658, Leopold would rule as such until his death in 1705. Leopolds reign is known for the conflicts with the Ottoman Empire in the east, and the rivalry with Louis XIV, after more than a decade of warfare, Leopold emerged victorious from the Great Turkish War thanks to military talents of Prince Eugene of Savoy. 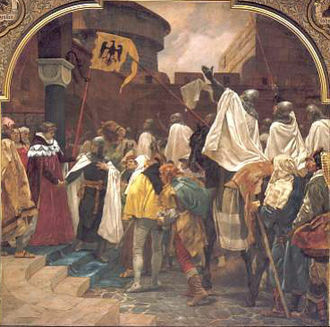 By the Treaty of Karlowitz, Leopold recovered almost all of the Kingdom of Hungary which had fallen under the Turkish yoke in the years after the 1526 Battle of Mohács. Leopold fought three wars against France including the Dutch War, the Nine Years War, and the War of the Spanish Succession, in this last, Leopold sought to give his younger son the entire Spanish inheritance, disregarding the late Spanish kings will. To this end, he started a war which soon engulfed much of Europe, when peace returned at the end of it all, Austria could not be said to have emerged as triumphant as it did from the war against the Turks. Born on 9 June 1640 in Vienna, Leopold received an education by excellent teachers. From an early age Leopold showed an inclination toward learning and he became fluent in several languages, Italian, German and Spanish. In addition to German, Italian would be the most favored language at his court, Leopold was schooled in the classics, literature, natural science and astronomy, and was particularly interested in music, having inherited his fathers musical talents. Originally intended for the Church, Leopold had received an ecclesiastical education. But fate put in motion a different plan for him when smallpox took his elder brother Ferdinand on 9 July 1654, Leopolds church education had clearly marked him. Leopold remained influenced by the Jesuits and his education throughout his life, and was uncommonly knowledgeable for a monarch about theology, jurisprudence and he retained his interest in astrology and alchemy which he had developed under Jesuit tutors. A deeply religious and devoted person, Leopold personified the pietas Austriaca, Leopold was said to have typically Habsburg physical attributes. Ferdinand III was Holy Roman Emperor from 15 February 1637 until his death, as well as King of Hungary and Croatia, King of Bohemia and Archduke of Austria. Ferdinand was born in Graz, the eldest son of Emperor Ferdinand II of Habsburg and his first wife, educated by the Jesuits, he became Archduke of Austria in 1621, King of Hungary in 1625, and King of Bohemia in 1627. Leader of the party at court, he helped negotiate the Peace of Prague with the Protestant states. Having been elected King of the Romans in 1636, he succeeded his father as Holy Roman Emperor in 1637, during the last period of the war, in 1644 Ferdinand III gave to all rulers of German states the right to conduct their own foreign policy. This way the emperor was trying to gain allies in the negotiations with France. This very edict contributed to the erosion of the imperial authority in the Holy Roman Empire. After 1648 the emperor was engaged in carrying out the terms of the treaty, on 20 February 1631 Ferdinand III married his first wife Archduchess Maria Anna of Spain. She was the youngest daughter of Philip III of Spain and Margaret of Austria and they were first cousins as Maria Annas mother was a sister of Ferdinands father. They were parents to six children, Ferdinand IV, King of the Romans Maria Anna Mariana, married her maternal uncle Philip IV of Spain. She was a daughter of Leopold V, Archduke of Austria and they were first cousins as male-line grandchildren of Charles II, Archduke of Austria, and Maria Anna of Bavaria. They had a son, Karl Josef, Archduke of Austria. He was Grand Master of the Teutonic Knights from 1662 to his death, in 1651, Ferdinand III married Eleonora Gonzaga. She was a daughter of Charles IV Gonzaga, Duke of Rethel, Maria Anna Josepha of Austria, who married Johann Wilhelm, Elector Palatine. Ferdinand Josef Alois, Archduke of Austria Ferdinand III was a patron of music. He studied music under Giovanni Valentini, who bequeathed his works to him. Some of Ferdinands own compositions survive in manuscripts, motets and other sacred music and his Drama musicum was praised by Athanasius Kircher, and the extant works, although clearly influenced by Valentini, show a composer with an individual style and a solid technique. It can refer to William II of Provence. William V, Duke of Bavaria, called the Pious, was Duke of Bavaria from 1579 to 1597, William was born in Landshut, the son of Albert V and Anna of Austria. He received a Jesuit education and showed keen attachment to the Jesuit Counter Reformation tenets and his title the Pious was given to him because he devoted his daily routine to masses, prayer and devotional reading. He took part in public devotions and pilgrimages and his residence as crown prince was the ancient fortified Wittelsbach seat Trausnitz Castle in Landshut. Like his Wittelsbach father and grandfather, William was a supporter of the counter-reformation. This dignity remained in the possession of the family for nearly 200 years, two of his sons followed ecclesiastical careers, Philipp Wilhelm became the Bishop of Regensburg and eventually a Cardinal, and Ferdinand succeeded his uncle, to become Archbishop of Cologne. 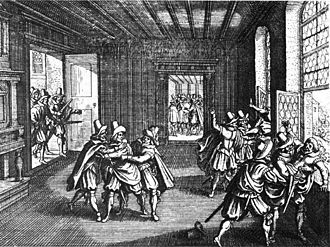 In 1591, Wilhelm expelled Salzburg from the Berchtesgaden Provostry, William is responsible for numerous executions due to Witch-hunt in his duchy. The Jesuit St. Michaels Church and college of the Jesuits were built in Munich between 1583 and 1597 as spiritual centers for the counter-reformation, williams spending on Church-related projects, including funding missionaries outside Bavaria—as far away as Asia and the Americas—put tremendous strain on the Bavarian treasury. The Italian confidence man Marco Bragadino who was promising to make copious amounts of gold to erase the Dukess debts was called upon by William V in 1590, and executed after he had failed. William abdicated on 15 October 1597 in favour of his son, Maximilian I and retired into a monastery where he spent the remainder of his life in contemplation and he died in 1626 in Schleissheim Palace. He is buried in St. Michaels Church, already as crown prince in Landshut William patronised the arts. Michaels Church, of the college and of the palace Wilhelminische Veste in Munich. The sculptors Hans Krumpper and Hubert Gerhard along with painters Peter Candid, the history of Schleissheim Palace started with a renaissance country house and hermitage founded by William. City Hall, seat since 1401. Church of St. Peter an der Sperr, as the City Museum. 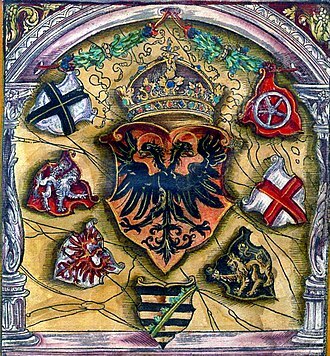 Coats of arms of prince electors surround the imperial coat of arms; from a 1545 armorial. Electors voted in an Imperial Diet for a new Holy Roman Emperor. Depiction of Charlemagne in a 12th-century stained glass window, Strasbourg Cathedral, now at Musée de l’Œuvre Notre-Dame. 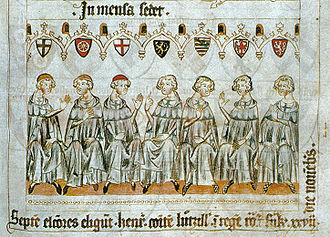 Illustration of the election of Henry VII (27 November 1308) showing (left to right) the Archbishop of Cologne, Archbishop of Mainz, Archbishop of Trier, Count Palatine of the Rhine, Duke of Saxony, Margrave of Brandenburg and King of Bohemia (Codex Balduini Trevirorum, c. 1340). La Bataille de Rocroi by François Joseph Heim. La Bataille des Dunes by Charles-Philippe Larivière. Interview of Louis XIV of France and his maternal uncle (i.e. Louis' mother's brother) Philip IV of Spain at the Pheasant Island. The Grand Condé at the battle of Lens, 20 August 1648, victory over the Spanish troops commanded by archduke Leopold. Jean-Pierre Franque, 1841, Galerie des Batailles. The Battle of Lens. Contemporary illustration, oil on canvas. Study for Rubens' equestrian portrait, 1625. Archduke Leopold's Gallery in Brussels, for which Wright collected (painting by David Teniers the Younger c. 1650). Bust of Mary, Princess Royal and Princess of Orange in Sanssouci. Dieussart's bust of Frederick III of Denmark.